Is A NORTHERN LIGHT by Jennifer Donnelly worth checking out? The Book Smugglers might have the answer in their review of the book. 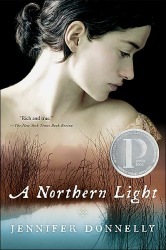 A Northern Light Synopsis: Mattie Gokey has a word for everything. She collects words, stores them up as a way of fending off the hard truths of her life, the truths that she can’t write down in stories. Buy A Northern Light by Jennifer Donnelly on Amazon .